Here's an interesting new book for trial and courtroom junkies. Rule 53: Capturing Hippies, Spies, Politicians and Murderers in an American Courtroom is the work of Andy Austin, a sketch artist from Chicago. Starting with the Chicago Seven trial (or, more accurately, with the Chicago Eight), Austin captured what cameras could not: courtroom excitement in the Second City. This volume includes a few dozen beautiful drawings from her past -and they reminded reminded me of what a great crime town Chicago really is. The pols: Otto Kerner and Ed Hanrahan (but alas, no Governor Dan Walker...on whose behalf I delivered a speech to Robert A. Black Elementary School in 1972...prior to his election and conviction.) The freaks: John Wayne Gacy. And of course the gangs: from the mob to El Rukn. Austin also does a nice job as a memoir author. In a sense she unearths material from her cutting room floor. I imagine that a sketch artist surveys the courtroom scene, mining only a few critical details in her image. Here, Austin shares all the other details that didn't fit in the pictures. And she shares some sarcasm to boot. Describing the trial of a corrupt legislator, she writes: the defense put on the usual selection of character witnesses: a cripple, a doer of good deeds in the slums, a priest, a couple of nuns. A nice middle-aged black lady said..."My opinion is he's a good man, he's an honest person, and I just love him." Looking at this material, I was reminded of another great sketch artist who covered the Chicago Seven trial: Franklin McMahon. For many years, these individuals were our only window to the courthouse - the only way in which the Sixth Amendment public trial right had teeth, in a visual sense. Times have changed, of course (notwithstanding Justice Souter's assertion that cameras will roll into the High Court over his dead body.) So what has technology and courtroom access done for us? Cameras capture more information, quantitatively. And they produce more salable entertainment. But there is special value in an artist's close reading of a tense scene and her rendition - in picture or memoir - of the things that mattered. 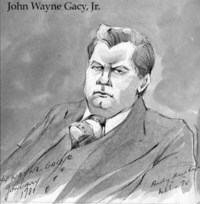 Image: Austin's sketch of John Wayne Gacy.